One of the accessories truly distinctive of a Roman soldier's military uniform is the Roman apron belt. It is sometimes called the leather war or battle skirt and forms part of the belt (Cingulum militare). The apron essentially protects the lower part of the soldier's body particularly the groin. Hence it is also referred to as the groin guard. It is commonly made with either metal or thick leather strips and has decorative metallic bumps, buttons or studs. It is a valuable piece of protective clothing that has been adopted by other Roman fighters like the gladiators. For my son's costume in his speech, I fashioned a Roman apron belt out of ordinary materials and school supplies. Here's the Roman Apron Belt or Groin Guard as worn in the Roman Soldier Uniform costume. Heavy brown paper or cardboard - I used the brown envelopes that contained old x-ray films or plates. They're slightly stiff yet not too thick. The color resembles that of leather. Paper brass fasteners - These are also called brads or split pin fasteners. Use those that have shorter pins at around 1/4 inch long. Crayon or Colored pencil - I used the color "Tan" but you could also use other shades of brown that you prefer. 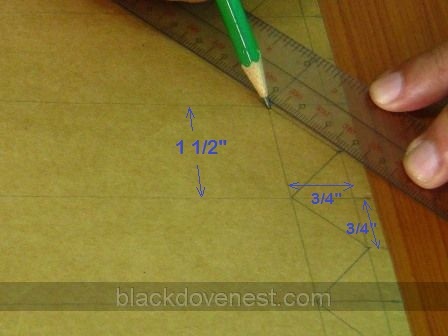 With a ruler and pencil, measure 11-inch long and and 1.5-inch wide strips of the brown paper from an x-ray film envelope. Each of the strips should have a 2-inch flap so the total length with the flap extended is actually 13 inches. Measure and draw six strips. Measure and draw pointed ends of each of the six strips as shown below. Cut the six strips with a pair of scissors. Note the 2-inch flap for each of the strips as shown below. This flap will be used as a belt loop. The created belt loop will be adequate for a 1-inch wide belt. With a dark brown-colored crayon, draw a thick border at the edges of the six strips. The light brown color of the paper resembles leather while the dark brown color at the edges adds texture to the "leather strip". Using a cutter or razor blade, cut a 1/4-inch slit positioned at 1/2 inch below the top edge of each strip. Also make a 1/4-inch slit on the flap of each strip. Pierce the paper brass fastener on the long side and ensure it exits past the flap. Pull apart the two pins of the paper brass fastener. The fastening completes the belt loop. Insert the belt through each of the belt loops of the six strips. 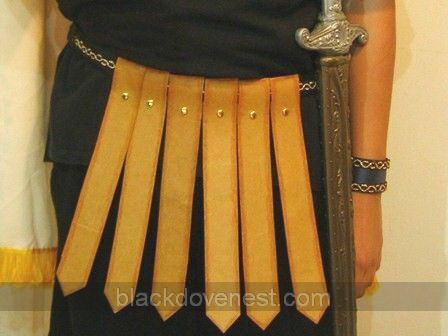 Shown below is the completed Roman leather apron belt with the scabbard attached. Notice the paper brass fasteners are both functional (fasten the loop) as well as decorative (shiny metal studs).